The small number of women role models in Science, Technology, Engineering, and Mathematics (STEM) careers is widely recognized. 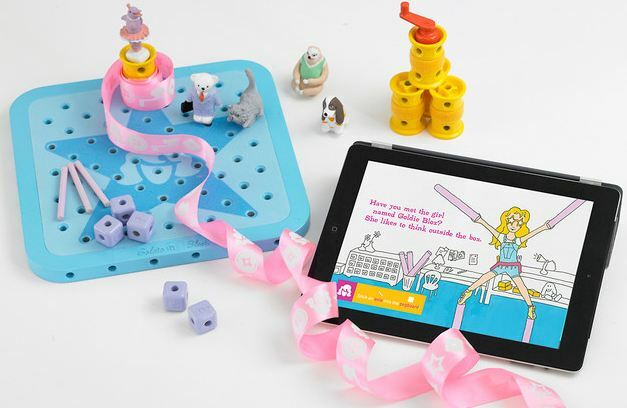 Debbie Sterling, a Stanford-educated engineer, is among a group of educators and entrepreneurs developing toys, books, games, and kits to attract girls to technical careers. She introduced books and construction toys for girls centered on a fictional role model, Goldie, in response to her experience of collaborating mostly with men during her studies of product design in Stanford’s mechanical engineering department. The first book, intended for girls, ages 5 to 9, is called GoldieBlox and the Spinning Machine. Goldie lives in “her engineering house with gears and moving parts everywhere,” five character figurines (including Nacho the dog and Benjamin Cranklin the cranky cat), and a construction toy, featuring a pegboard, wheels, axles, blocks, a crank, a ribbon, and washers. Goldie creates a “spinning machine” for her dog, who enjoys chasing his tail and yelling out random words in Spanish, by deconstructing a ballerina music box and reverse engineering it. Girls can create their own spinning toys with as they read through the story. Her next products include books with a pulley system elevator, a parade float, circuits and gears, and an eBook where Goldie learns to code. Another product intended to increase girls’ skill and confidence in working with technology is Hummingbird, an educational robotics kit. 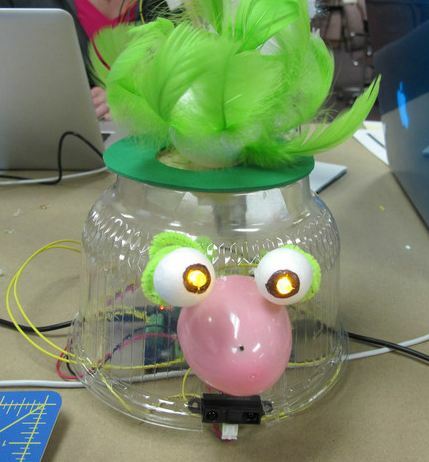 Developed at Carnegie Mellon University’s Robotics Institute’s Arts and Bots program, spin-off startup BirdBrain Technologies, showcases robotics with craft materials and text to communicate thoughts, feelings, or ideas. The kit includes a control board, lights, sensors, and motors. Students (usually ages 11 and up) program their creations on a computer by dragging and dropping icons, so they don’t have to learn computer languages. Students have experimented with making a robot from cardboard wrapped in tin foil that can twirl, flash lights, and even impersonate the Star Wars robot, R2D2. Another project was a dragon made of paper and popsicle sticks that flaps its wings and hisses. Others crafted a robotic arm with muscles made of cast-off pantyhose. Pennsylvania students analyzed poetry, then created animated scenes for poems using the kit. Elsewhere high school students created kinetic sculptures with sensors that detect environmental changes and respond with movement. Others built a “coin monster” for the school’s ancient coin exhibit. Research Associate Emily Hamner and Tom Lauwers, the founder of BirdBrain Technologies conducted workshops to learn girls’ goals and interests in making robots. They learned that girls are most interested in creating robots that can tell stories, dance, communicate, and interact with people. -*What toys and games have you seen increase young people’s interest in Science, Technology, Engineering, and Mathematics activities? This entry was posted in Career Development, Working Women and tagged Career Development, Debbie Sterling, diversity, Emily Hamner, GoldieBlox, Robots, STEM careers, Tom Lauwers, Working Women on June 17, 2012 by kathrynwelds. Mala Devlin, Engineering Manager at Cisco Systems and Trina Alexson‘s book, Bit by Bit encourages young women in high school and university to pursue high tech careers. Devlin and Alexson interviewed more than 40 women across leading Silicon Valley companies to highlight the top 10 reasons why young women should consider careers in Science, Technology, Engineering, and Mathematics (STEM) careers, despite women’s under-representation in these fields. The authors provide descriptions of job roles and career paths, and list skills required to succeed in technology careers. Insights from this book are equally applicable to young men, and the authors encourage members of all under-represented groups to consider STEM careers. -*What practices have you seen increase interest in STEM careers among young women and other under-represented groups? This entry was posted in Career Development, Leadership, Working Women and tagged Anita Borg, Career Development, diversity, Leadership, Mala Devlin, STEM careers, Trina Alexson, Working Women on May 23, 2012 by kathrynwelds.